Along with his 25 member crew, which included clerk, Arthur Hayes, steward William Shepard, and purser, Alfred Haynes, Captain Napier had a full roster of between 75 and 100 people on board when he left Grand Haven for Chicago on the night of October 15, 1880. He anticipated that this would be “another routine run” for the Alpena. On shore in Illinois and Wisconsin, the wind blew about 125 miles per hour. Only a few inches of snow fell, but the high wind drove it with such force that railway cuts and most roads were packed in with drifts. Traffic in Milwaukee and Chicago came to a complete standstill. Rescue parties in sleighs and sleds floundered to stalled trains with food and blankets. The windows in many Milwaukee and Chicago homes were broken by the force of the wind, and many people shivered in front of their fireplaces and coal stoves. On October 19, 1880, the body of a woman washed ashore five miles north of Holland. The next day the body of an eight year old boy was found. Thousands of apples from carloads of apples that the Alpena carried on her deck and a piano without a cover washed ashore. A water soaked note was found in a piece of wooden molding in a part of the cabin that washed ashore. The note said that the Alpena was sinking, Grand Haven to Chicago. The signature looked like that of George Connell, but it was really too waterlogged to read. 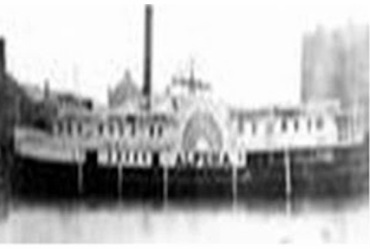 The scattered wreckage and the two bodies were all that remained of the Alpena and passengers. The old salts of Lake Michigan speculated that the rudder chain of the Alpena broke again, leaving the ship at the mercy of the waves. Many of the passengers on the Alpena were unknown and unmourned because some were pioneers coming to settle in Wisconsin and were without friends. Others had no one to identify them. The storm that caused the sinking of the Alpena blew for three days over the Great Lakes. This mid-fall blizzard covered a 500 square mile area, including parts of Nebraska, the Dakotas, Minnesota, Iowa, Wisconsin, and Northern Michigan. It deposited several inches of snow on city streets and in country glens alike, damaged property, and destroyed vegetation. It was the forerunner of what the old timers called “The Winter of the Big Snow.” Late in March of 1881, when three days of nonstop, heavy snow heaped up drifts 40 feet high and people huddled around their firesides, they still spoke of the fall storm that sent the Alpena to the bottom of Lake Michigan. Mansfield, J.B. ed. History of the Great Lakes, Vol. I and Vol. II. Chicago, J.H. Beers & Co., 1899. Ratigan, William. Great Lakes Shipwrecks & Survivals. Wm. B. Eerdman’s Publishing Co. , 1977.